The boys and I are still working on 2 of their books - Winnie the Pooh and Stories for Boys. We are heading back to the library on Monday to return a handful of dinosaur books. So, I am sure we will be heading home with another handful. They love the library. I'm thinking we are even going to try out Toddler Time this week. And, of course, I always have holiday books! The boys are LOVING the I Spy Books. Alex loves to look at the pictures and "talk" to us about what he sees. Andrew likes to tell Alex what he is pointing to. It is pretty funny. Alex say, "Dadada bababa" something and Andrew says, "No no Alex. Bird." Or whatever the thing might be. Lol, super cute. 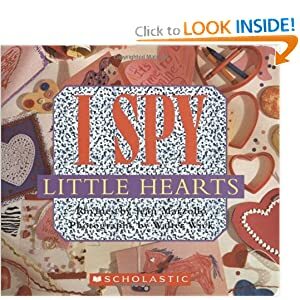 So, our I Spy book we have is I Spy Little Hearts perfect for little hands. It simple enough to where they will not get frustrated if they cant find it right away, but tricky enough to where it takes Andrew a few moments before he finds it or calls for some help.